Popular thoroughbred owner Mark Sowerby has experienced the highs of winning races during Melbourne Cup week, but this will pale into insignificance when he swims the English Channel for charity next month on August 10. 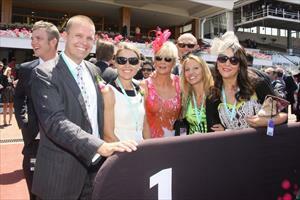 Mark, pictured enjoying the win of Keep De Rose on Oaks Day in 2012, is aiming to raise $1 Million for the Starlight Foundation with planning and training for the swim taking well over 12 months. His training program for the grueling challenge, that has seen Mark team up with Olympic Champions, has had him swimming endless hours in rivers, lakes and seas throughout the world. The Queenslander has documented his entire journey and to follow his progress leading into next month's swim and to donate please visit his Channel Swim for Starlight by clicking the link below.